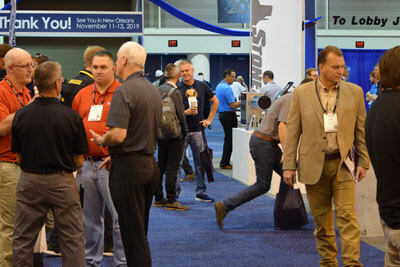 The WaterJet Technology Association (WJTA) welcomed 1,000 high level participants from 33 countries to the 2018 WJTA-IMCA Expo held November 1-2 at the Morial Convention Center in New Orleans, Louisiana. The live demonstrations were delayed by severe weather for a few hours on Thursday, November 1, but one of the largest crowds ever was on hand Thursday afternoon to see new pumps, robotic shotgunning systems, heat exchanger cleaning, industrial vacuum trucks and hands-free robotic vacuuming, automated indexing of tube bundles, and coating removal and surface preparation. WJTA will return to New Orleans, November 11-13, 2019, for the biennial WJTA Conference and Expo. The 2019 program will include the daylong Waterjet Technology Basics & Beyond Short Course, technical research paper and case study presentations, exhibit displays of the newest products, systems, trucks and services, and live demonstrations. View details and photos from the 2018 Expo on the conference/expo website: 2018 Expo Recap .